Escada celebrated its 40th anniversary Sunday by making a New York Fashion Week debut with soft power dressing for the working woman -- an upbeat and colorful collection that paid tribute to the 1980s. 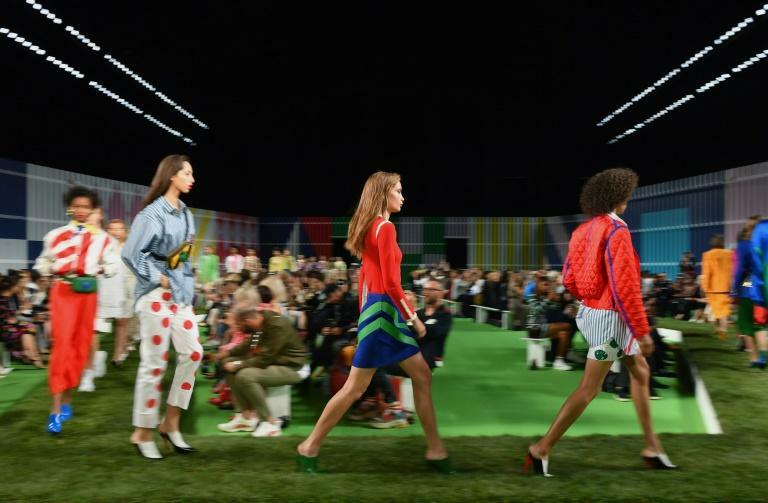 Models strode down a serpentine grass runway for the Munich-based luxury brand's first runway show since 2015 and the second full collection of young Irish designer Niall Sloan, who joined Escada last year and who earlier in his career spent a decade at Burberry. There were power suits with big gold buttons and gold chain belts, in bright colors with boxy jackets cut loose and comfortable, paired with tennis shoes that evoked joyfulness and ease of movement. Sloan explained that the concept was "very, very soft power dressing" for the modern working woman. If shoulder pads were the 1980s way of muscling into a man's world, in the 2010s it's about being effortless. "You're still the mother, the carer, the sister, the diplomat, the person who holds things together," he told AFP. "I want you to put something in the morning and feel effortless and go throughout the day and kind of not think about it anymore because you have enough to do." Escada has a strong working women's identity. It was founded in 1978 by Margaretha Ley and her husband, and is today owned by Megha Mittal, who acquired the brand in 2009 after it filed for bankruptcy. 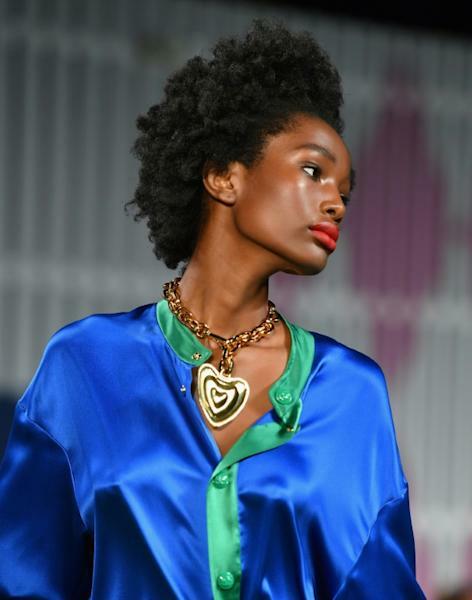 Escada's spring/summer 2019 was a riot of bright color from yellow jackets to fuscia skirts, oversized silk shirts to red, orange and colorful jackets covered in colorful ESCADA letters. There were black dresses covered in bright florals, and contrast in the form of beige and cream, with plenty of stripes and dots -- an homage to Julia Roberts in "Pretty Woman" with a reinvention of the brown dress with white polka dots she wore to the races in the movie. 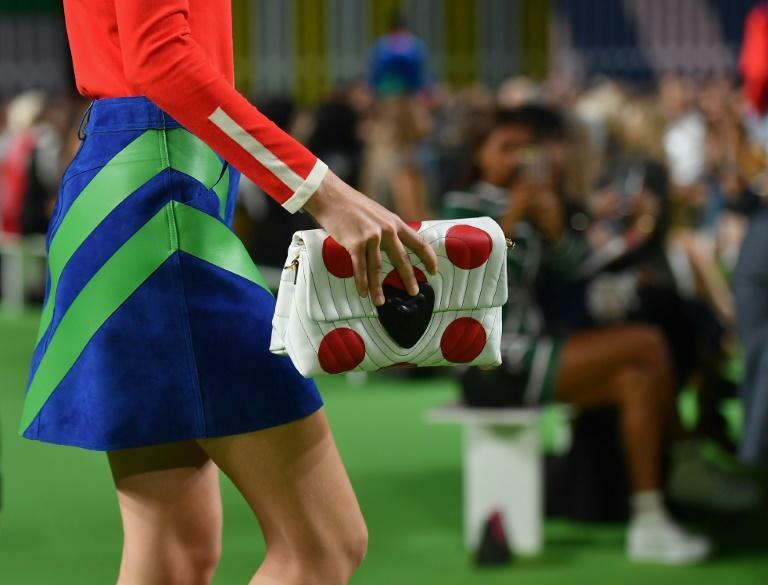 Equestrian prints and jockey motifs harked back to the brand's origins. The name Escada came from a racehorse that Margaretha and Wolfgang Ley spotted at a racetrack. As befits the best of any anniversary, it looked back as well as forward. Sloan said Ley was a constant inspiration and that her collections were "always done with a touch of lightness." "Especially today, when things are heavy and dark and difficult and we don't know the way through, it's good to deal with that with a light touch," he said. "I think it's a very female strength." Three of the models in a show by critics' favorite Sander Lak were older than customary, and one of them was his mother. Otherwise, there were bright colors and white, crinkled paper and plastic materials. "To have a moment when I can celebrate what I am doing, with the people I love is really great," said Dutch creative director Lak, who created his label Sies Marjan in New York in 2016. "It's all these different people in my life -- my mom was in it, my childhood friends, my new friends," he said. German house Hugo Boss, which parted ways with New York designer Jason Wu last season, summed up its collection as "California Breeze," but if so, it was a Teutonic interpretation of life in the Golden State. There were soft blush suits for men, surfboard-style stripes running down the sides of pants and draw-string waists. Architectural-style prints on smart work dresses for women were another key look, as were wide-brimmed intrepid hats with accents in maroon, black and blue. When it came to footwear, it was ankle-high gladiators for women, but for men, Hugo Boss decided to bring back socks and sandals.